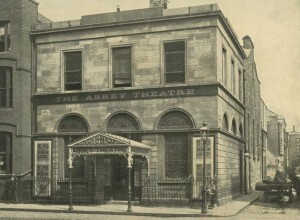 It concentrates the mind wonderfully when I realise, in this, the centenary year of the Abbey Theatre’s foundation, that when I was first taken there as a child of eight or nine, the theatre was a bit less than forty years old. W.B. Years was still alive and still appeared sometimes at the top of the parterre steps on Saturday afternoons to ‘count the house,’ as my father said. Even at that age, I thought the long silvery hair and the exactly matching shade of the beautiful silver suit of clothes very dashing. Sometimes he sat down right in front of us until the first interval. But mostly, having counted the house, he went away. If he counted us among the paying customers, he was greatly mistaken. Nellie Bushell could have told him that. She was a quiet-spoken little Dublin lady who sold programmes and showed you to your seat. She seemed to me very much older than Mr Yeats, and she always wore black. She had a tiny face under the wispy grey hair, and small eyes which were usually watering from hay fever, and frequently had to be mopped with a damp handkerchief. My father – she called him Rajah – always had a chat with her at the interval, and once he took her home to Inchicore by taxi in order to find out what was the trouble with her fuse box, which kept plunging her house into darkness on unpredictable occasions. My father knew Nellie Bushell as a trusted friend since the days of the Rebellion (as they both called the Rising of 1916) and he told me she was only a young girl at the time, and whizzed around the city delivering important dispatches on her bicycle. Her house, where she made us tea and gave me Hadje Bey’s Turkish delight, was wallpapered with old playbills and photographs – and she had a cat which accompanied me from room to room when she invited me to look around. Only once again was I ever to see a house so full of photographs of faces familiar to me from the stage, and that was, you might say, at the other end of the timeline in the seaside house of the actress Shelagh Richards. There was a photo of her too in Miss Bushell’s house, as one of the sisters in The Constant Nymph. However, the person who amused me most on one of those Saturday afternoons was not on the stage. It was a full house that day, for Lennox Robinson’s The White Headed Boy, and the loudest laughs came from a tall young man who apparently wasn’t able to get a seat because he hadn’t come in time. He sat on the floor at the end of our row, with long legs curled around one another, and his high shouts of laughter stood out among the rest. My father and he exchanged a word or two on the way out, and later, I asked who he was. ‘Lennox Robinson,’ my father said, shaking his head and laughing again. That was what gave me the notion that as a grown-up you couldn’t have a more enjoyable job than writing plays. The wonder is I never tried it. In my experience you never actually see anyone reading a novel of yours, although once on the bus I saw a man in front of me folding his Evening Herald and beginning to read a weekly column I used to write for it. Unfortunately, he read no more than fifty words or so before turning to the sports page. Oh well, I’d only abandoned my bike that day because of the incessant rain. It would have been better to get soaked to the skin really, because there are some things it would be better not to find out. But actually being one of the same audience which is falling around laughing at your play – now that must be something.